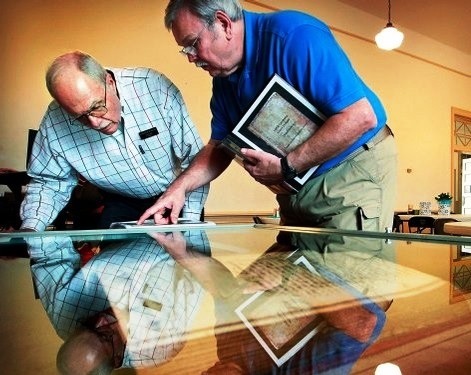 Photo: Jim Wadell (left) and Barry Appling view page copies of an old store ledger from the 1800s for entries referring to Appling’s extended family. The original ledger is encased under protective glass in the case in the foreground. Thursday February 20th, Darlene Sawyer curator and director of the Cordova Museum unveiled the encased ledger, along with copied pages from the 512- page book to members of the Descendants of Early Settlers of Shelby County. Alma and George Crone, Jr. discovered the ledger in a plantation desk at their home and donated it to the museum. The ledger which spans 1858 to 1862 came from a store owned by Samuel B. Snowden and run by Thomas Williams. It documented items sold to local customers in the area known as Maryville, presently known as Cordova. About 475 individuals are listed, each of whom bought items on credit. The Cordova Community and Museum is located at 1017 North Sanga Road in the historic Cordova School built in 1913. The museum is open from 9 am to 4 pm Tuesday, Thursday, and Saturdays.